Volvo Car Corporation has paved the way for implementation of communication between cars by signing a Memorandum of Understanding. The Volvo Car Corporation has always been about building safe cars, but the Swedish automaker has just stepped up their pursuit of implementing shared technology for communication between cars. Back in July we reported that Volvo has a stated goal that by the year 2020, that nobody should be seriously injured or killed while driving a new Volvo car. They even went further and said no Volvo cars are to be involved in collisions in the future. Volvo has released new information that they have moved closer to that goal by signing a Memorandum of Understanding (MoU) with the members of the Car 2 Car Communication Consortium regarding implementation of shared technology for communication between cars in 2016. Volvo has always been known for their cars having the latest safety features, so it shouldn’t be a surprise that they are the automaker leading the charge in car 2 car communications. Volvo has been a member of the Car 2 Car Communication Consortium since November 2011. Most of Europe’s automakers are also members and the consortium works towards a common European standard that will create safer roads through building more intelligent transportation systems. One of those key systems will develop the technology for cars to communicate with each other. With the aim of enhancing road safety, Volvo and the Car 2 Car consortium will be working on several different projects. Several systems will allow cars to communicate with each other (Car-2-Car), like providing information in the event of road construction or an accident along the route. And another system will convey information about what is happening along the route (Car-2-Infrastructure). Volvo is also working on three other technologies to make their vehicles safer: Autonomous Driving Support, Intersection Support and Animal Detection. 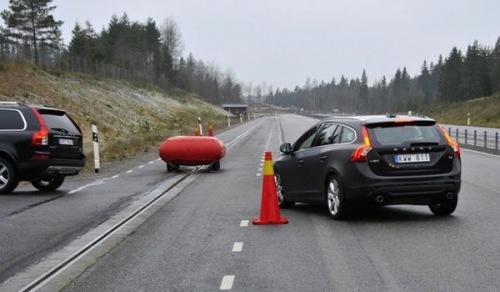 By the year 2020, Volvo wants every one of their cars to be fitted with this new technology. The Swedish automaker says the new safety systems will reduce driver distraction to the point that no passengers will be seriously injured or killed in one of their cars. Volvo has always been committed to building safe automobiles, but by signing the MoU with the members of the Car 2 Car Communication Consortium, they are paving the way for all cars to drive safely.